My friend's beautiful Jersey Giant grew into quite a big rooster, too big for her hens. Here's what I recommended. After a strength training session at the gym I noticed my friend Mariana rushing toward me, a look of determination on her face. “I need your advice,” she said, her story unfolding as we walked together to the stretching area. Mariana and her husband Jayce own a hobby farm bordered by woods inhabited by coyotes, raccoons, opossums and other predators. I had suggested they get a rooster to protect their hens. That rooster (who had become a very big rooster) was now at the center of Mariana’s situation. Mariana had lost her heart to a gorgeous, bright-eyed Jersey Giant boy with gleaming green-black feathers. She’d purchased him as a cockerel, then watched him grow—and grow and grow—into his massive adult size. Unfortunately, Mariana’s hens are diminutive Easter Egger girls, and the Jersey Giant rooster dwarfs them. To keep the big rooster from literally crushing his flockmates during amorous activity, Mariana had isolated him in her barn, where the poor guy languished. Mariana’s concern was legitimate. 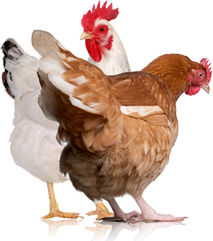 As social animals with a complex hierarchy, chickens need to interact with each other for their mental and emotional well being. 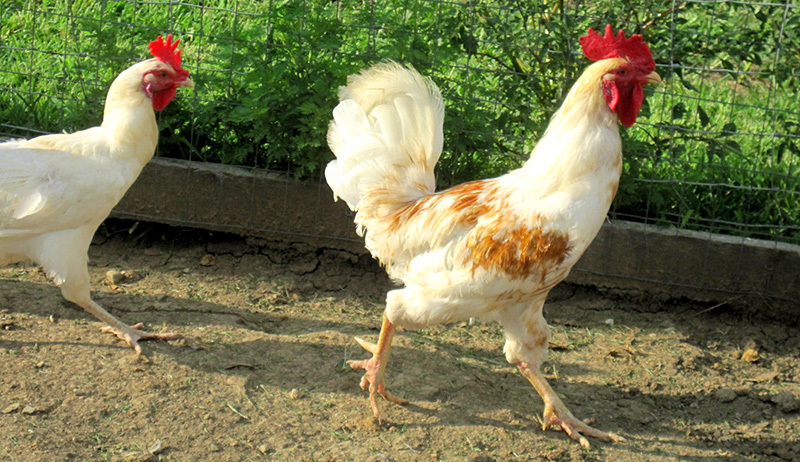 A lonesome rooster can quickly become depressed and dejected, then decline physically from there. Mariana loved her big rooster, but she also cared deeply for her hens, and she did not want to risk their becoming pancakes. Her dilemma fortunately had several relatively easy potential resolutions. 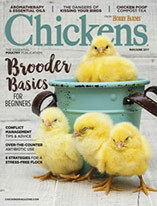 If your roosters are disproportionate in size to your hens—and that includes being much smaller than your girls—consider the following suggestions. Mariana’s big rooster spent his days and nights locked away inside her barn. I suggested creating a separate run for him so he could enjoy the sunshine and fresh air. This way, the rooster’a health would get a huge boost, and the boy would be able to interact with his natural surroundings. By being outside, he would also be able to perform his original function of protector. He’d be able to keep an eye on his surroundings and call out to the nearby hens should any predators appear. While Mariana couldn’t change the size difference between the big rooster and her smaller Easter Eggers, she could take some mitigating measures. Regular clipping of her Jersey Giant’s toenails would lessen the damage his claws could cause his mating partners. Outfitting the girls with hen saddles would also help minimize feather breakage and loss. Setting up some hiding spots for the hens would let the girls escape any overly amorous pursuits while still allowing the rooster to share their run. By purchasing a Jersey Giant rooster for Easter Egger hens, Mariana and Jayce demonstrated that they weren’t sticklers for breed separation. 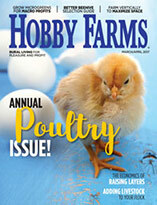 I recommended seeking some adult Jersey Giant or Light Brahma hens for their rooster. Pullets, even in a generously sized breed like the Jersey Giant, would be too small and inexperienced to handle the rooster’s attentions. Older hens, however, wouldn’t tolerate any nonsense from the big rooster and might very well teach him a thing or two about how to treat a lady. If you want to keep your breeds separate, seek females that match your male’s breed and variety (aka Black Orpington hens for a Black Orpington rooster). Despite knowing that Mariana was attached to her big rooster, I still suggested putting him up for sale. The lonesome boy deserved to have a home where he could socialize and range with his fellow chickens. Keeping him separated for the rest of his life was not a viable or compassionate option. Maintaining two separate poultry areas also added to Mariana’s and Jayce’s workload, something that could be eliminated from their chore list with the sale of the rooster.